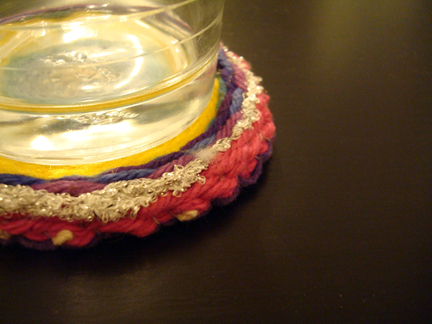 When I’ve gotten a big enough circle (I decided that I wanted to make a coaster half way through), I cut the strings near where they’re taped to the plate, one at a time, and tied each loose end to the last round of weaved yarn. 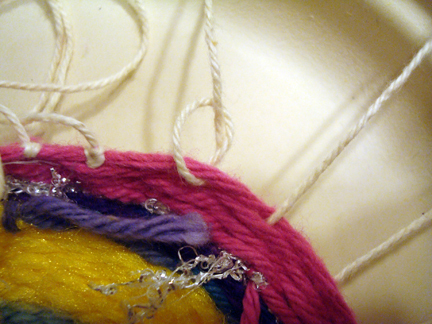 I hid all the loose ends and yarn tails under a piece of felt, which I cut to the size of the finished weaving and sewed onto the weaving around the edge. And this is the front! Did it all while watching TV. Very relaxing. 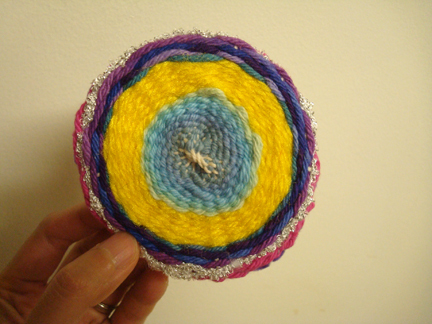 I think it would so much fun to organize a weaving party, where everyone can weave and chat. Considering my yarn stash, I better do something with all of it! 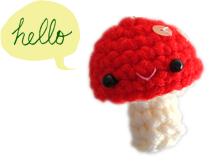 I can’t crochet/knit fast enough! oooh, that’s an awesome idea! thank *you* for the inspiration! Another winning project! I love how you jumped in and made it your own; so cool! thanks Nancy! spontaneity is quite exhilarating! Love it!! I think I may have to try this today, thanks for sharing!! absolutely! :D wow, martha has a loom kit? 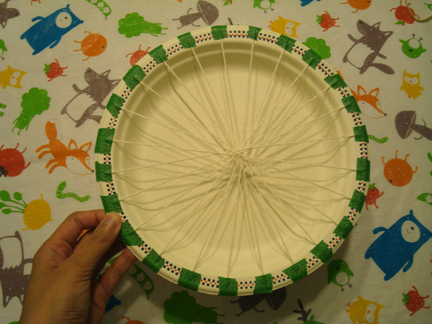 I love the idea of using a paper plate to create a loom. Drat. I’m too far south. LOL as long as I don’t have to Skype! When getting pizza, we asked for a few extra sizes of the pizza rounds and used those. My young sons (8 & 10) are making hand bags and “boy stuff bags” ?? lol. You can connect 2 or fold 1 in half and stitch together. 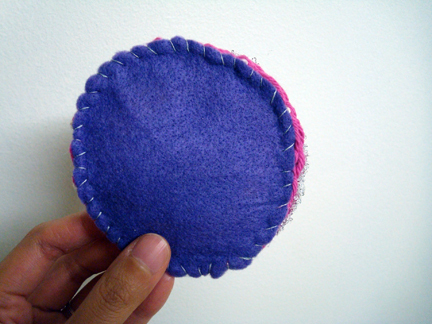 You can fold and stitch the upper 1/8~1/4 down. in or outside the pouch. Add a button or Velcro dot for a simple closer. Straps can be added using whatever scraps you have. 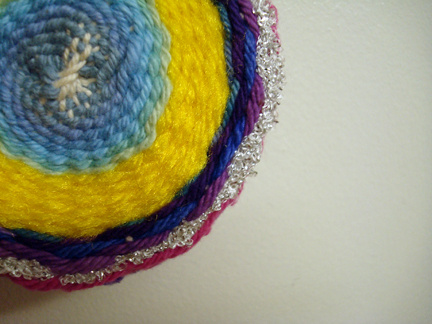 You can braid thick yarn, attach 2 loops to the back, and the kids can put their belt through them and wear it that way. They have made hats, foot warmers, pot holders, and now are trying to find the best way to connect them together for small blankets for my older son’s twins. 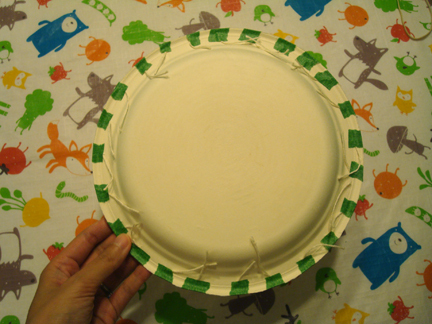 I love this craft, it is so easy for any age.